LPPM SGU was reformed in 2010 with the official name, Academic Research and Community Service (ARCS), as part of the reconstructed SGU Organization. 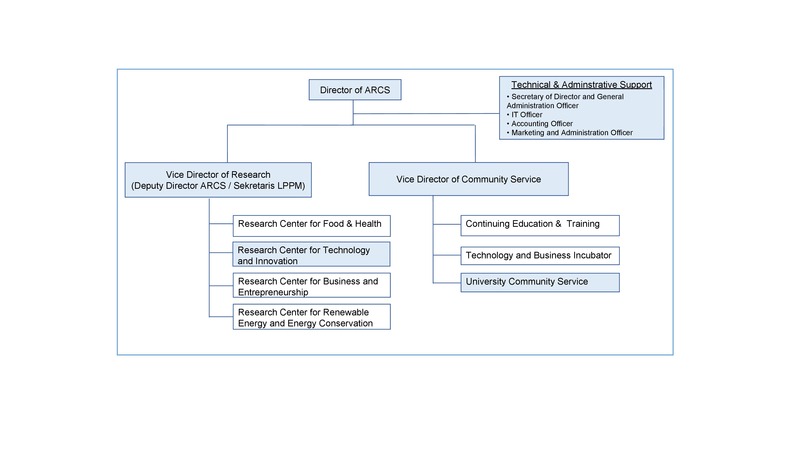 ARCS has the task of coordinating, monitoring, assessing and documenting the implementation of research activities and community service organized by the departments / faculties or other SGU units as well as promoting, facilitating, and monitoring the allocation and use of resources. The Academic Research and Community Service (ARCS) at Swiss German University aims to develop a culture of research in the university and to encourage the utilization of the research results in order to support higher education and national sustainable development in a professional manner. All the Community Service is conducted under the coordination of ARCS. SGU welcome partners from industries, local governments, research and education institutions to jointly conduct community service. 2. Research Center for Technology and Innovation. 3. Research Center for Business and Entrepreneurship. 4. Research Center for Renewable Energy and Energy Conservation. 1. To improve continuously the capacity and quality of the system, resources and research governance at SGU towards the research university. 2. To ensure that the output of the development of science, technological products and business innovations able to put SGU as one of the reference University in the field of science, technology and business nationally and internationally. 3. To improve the implementation of the product of science and technology, as well as business innovation generated by encouraging their utilization in the community to improve the quality of life and the prosperity of the nation. 4. To increase the active role of the institution and building the national and international research networking, which include universities, industries, government and community. 1. Development of the use of natural materials and systems for food and health security. 2. Development of instruments and equipment process industry in the fields of food and health. 3. Sensor technology research and application. 4. IT security and malware research. 5. Research distributed autonomous intelligent manufacturing system. 6. Increasing competitiveness of human resources and products based on local strengths. 7. Improving the quality of business to achieve sustainability growth SMEs and corporate. 9. Research on energy conservation. 1. Unit for Continuing Education & Training. 2. Unit for Technology and Business Incubator. 3. Unit for University Community Service. 1. To ensure that output of the development of science, technological and business products capable for creating technological innovation to encourage economic development. 2. To improve the implementation of output of the science, technology and business product by encourage their use in the community to improve the quality of life and the prosperity of the nation. 3. To conduct activities, that empower the alleviation of economic, political, social and cultural marginalized community. 4. To do the transfer of technology, knowledge and business skills to the community to develop human dignity and natural resources sustainability. 1. Improvement of governance implementation and quality assurance systems of community service. 2. Facilitating the provision of basic needs, public health and the environment (clean water, nutrition, waste management and sanitation). 3. Community empowerment in accordance with the potential and local resources. 4. Increasing the capacity and ability of the community through education and training. 5. Development of entrepreneurship ability of beginner entrepreneurs.